Unity Mural After racist vandalism haunted the Eastern Michigan University community last year, Sigma Alpha Lambda members helped create unity and peace on campus. 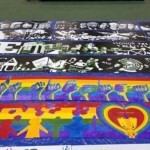 They joined with other students, faculty, staff, and alumni to create a unity mural. 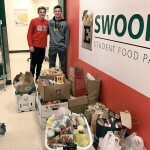 Swoop’s Pantry March Madness Each year, Swoop’s Pantry (an on-campus food bank) hosts a March Madness event to increase donations across the EMU campus. Sigma Alpha Lambda members are invaluable to this project. Sixteen buildings on campus competed with donations. 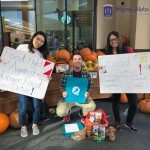 Continuing the Fight in 2017 The Food Fight Against Hunger is the centerpiece of SAL’s fall volunteering. 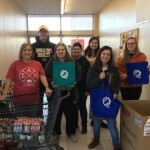 This year, 26 chapters worked SO hard to collect over 5,000 items and over $1,000 to fight hunger.